Tournesol Cottage has far-reaching views across rolling fields. Its large glazed doors open onto a beautiful terrace and steps lead down to the private, crystal clear pool. The pool is for the exclusive use of guests of Tournesol Cottage. A home from home, the cottage has all you could need for a luxurious break. The bedrooms are bright, airy and beautifully furnished. The bathrooms have large walk-in showers and lots of large fluffy towels. Downstairs is large, open plan and comfortable with its L-shaped sofa, lovely oak table and newly fitted kitchen. A generous welcome hamper is provided on your arrival, as are pool towels. An historic château, off a tiny lane, set in its own grounds and surrounded by 20 acres of land, along with two recently converted cottages. It has all you could ever want for a relaxing holiday. At the other side of the château stands a pigeonnier tower, which has been extended to provide a romantic, but spacious, hidden-away tower. Downstairs, each cottage has an open plan kitchen/living area, with large patio doors leading to a terrace, with barbecue, and the private pool. The pool is not shared with anyone else. The views across the surrounding countryside are amazing and uninterrupted. Upstairs, each of the two bedrooms has an en-suite shower room. Again the views are wonderful and far reaching. The shower rooms are modern and fresh. We have tried to provide everything that you will need for a relaxing break - pool towels, a coffee machine, a fully equipped kitchen, hairdryer, lots of fluffy towels, English TV, DVDs, wifi and a generous welcome hamper (the contents vary depending on the season, but this generally includes tea, coffee, wine, cheese, fruit and chocolate). The cottages are part of a converted barn. Although the other cottage is next door, it has its own pool and is completely separate and private. At the far end of the barn is a utility room with a shared washing machine and laundry area. The land around the cottages and château runs to around 20 acres and is perfect for exploring in peace. The cottage provides spacious accommodation for up to 4 people (+ babies under 2). If needed, we can provide high chairs, a cot, and a selection of toys. There is a sound-proofed door between the two cottages. This is normally kept locked, but can be open for larger groups to provide accommodation for up to 8 people (over 2 years). 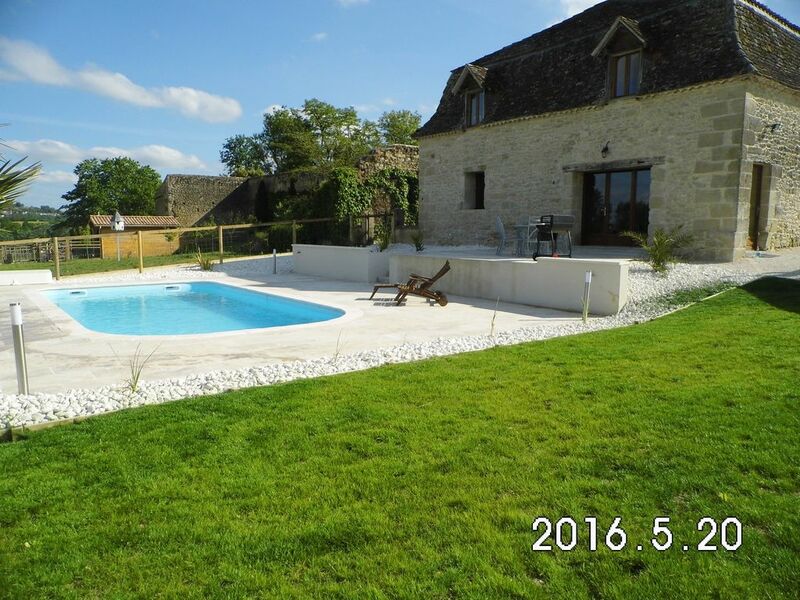 Tournesol Cottage has its own private pool, as does Coquelicot Cottage. The château is away from the cottages and has its own courtyard and private pool. Inside, there are 7 bedrooms (each with its own bathroom), an enormous kitchen with large sitting area, 4 other reception rooms and a large utility room. There is a large tobacco barn provides plenty of shade for relaxing by the pool on sunny days. This leads on to an outdoor dining room, complete with its own chandelier and views of the large pond and fields. We come out with our children to spend several months each year at our beautiful house in France. The property is a home from home: it is comfortable, has everything you could need, the situation is perfect and the weather is, generally, lovely. We chose this property, quite simply, as it is beautiful and the setting is perfect and peaceful. The unique benefits of the property are the terrace with amazing views, the crystal clear private pool, watching the beautiful birds swoop and dip into the water, enjoying a glass of wine, relaxing and enjoying the fresh local food. The bathrooms are newly fitted. Electric radiators are there for use in the winter. There is a separate laundry/utility area which is shared with another holiday cottage. There is plenty of easy, off-road parking. We have satellite internet which is fine for checking emails and surfing the net, but it can be a little slow. Unfortunately, it is too slow for streaming. Data usage is unlimited. All towels are provided, including pool towels. We do ask you not to use the bathroom towels around the pool. The living room is large and open plan with the kitchen / dining area. It has a comfy L-shaped sofa and large patio doors that overlook the terrace and pool. The kitchen is new, fully kitted out and has plenty of storage. The dining area is open plan and has a lovely oak table. Please let us know in advance if you need a highchair. There is digital TV that has English channels. There are some boxes of toys which are in the laundry room for people to use. There is a selection of DVDs in the cottage. Please let us know if you would like to borrow a bike. Helmets not included! The cushions for the chairs are in the cupboard downstairs in the cottage. Please put the parasol down at night. The toilets are both upstairs and there is gravel outside. The pool is simply perfect! Restful and relaxing, beautiful rural location. We are a francophile family with two young teenage daughters, we have often rented gites in the past. We chose the area for its reliable sunshine, beautiful countryside and attractive villages and towns to visit for market days and cafes. We enjoyed picking up bread and pain aux raisins from the boulangerie in Lauzun and visiting Eymet for supermarket shopping (small but well stocked Carrefour) and soaking up some French atmosphere in the attractive square. We also enjoyed visiting Monbazillac and Bergerac among other places. We had a very enjoyable and restful week in Tournesol. The cottage is semi-detached so you can greet your neighbours in Coquelicot if you wish as you come and go, but each enjoy the privacy of your own pool and terrace. The orientation of the building allows Tournesol near panoramic views across attractive farmland and to a hill top town in the distance. The cottage is beautifully restored, spacious and comfortable. For example, attractive modern bathrooms with the ancient beams left exposed. The outdoor hard landscaping is done to a high specification and the whole location (the chateau, the cottages and the pigeonnier) has clearly been a real labour of love for the owners. Charlotte and Michael care about the comfort of their guests, for example the bathroom, pool towels and bed linens are of excellent quality; there is plenty of lovely, quality crockery, cutlery, and cookware. Significantly, they responded quickly and kindly to a request we had during our stay, which had also been the case with our enquiries during the booking process. Our girls were very happy in and out of the pool, playing the boules and badminton provided and using the various benches dotted about the large gardens to read their books. We watched a couple of DVDs in the evening, but otherwise were happy to leave screens behind. Overall, a lovely property in a wonderful part of France. We had a very enjoyable stay in Tournesol cottage, and were well looked after by Trish and Neil. We found many small towns and markets to visit and went by train from Marmande for a day in Bordeaux. Altogether a very relaxing holiday. We spent 3 weeks at Tournesol Cottage in August 2017 with our 2 young boys, aged 3 and 6 years. All of us had a great time, the boys loved the pool and exploring the grounds - we got the chance to really relax! The cottage itself has been finished to a nice standard and makes for a comfortable stay. Neil & Trish, the property guardians, live in a separate cottage on site - they are very friendly and welcoming, making sure everything is OK for your stay. Neil kept the boys entertained as he cleaned the pool and tended to the grounds! We had a good run of decent weather during our stay, with temperatures up into the mid-30s. A couple of thunder storms rolled in over the hills during the evenings - fascinating to watch with it being so open there. Wi-Fi is available at the cottage but due to the location, speeds are quite slow, with the connection dropping out sometimes. I found switching to a mobile hotspot was better at times. You have to remember that you are in deepest rural France - it's not your typical holiday resort and you have to venture out further for supplies and activities - but that's what makes for such a relaxing stay. Had a great week in the Tournesol cottage- the conversion to a gite has been tastefully done so it is all simple but stylish. The position of this gite means you look out over beautiful countryside. The pool is in sun all day (until 8ish for us staying at the end of July) with the patio being in shade in the evening which worked well for us. The open plan space downstairs was generous for 4 people and upstairs the en-suites to both bedrooms was rather luxurious! Neil and Trish, who were lovely, were available if needed as they lived the other side of the other gite, but kept a discreet distance. All in all a great find and we are hoping to go back! We stayed in the Tournesol gite in mid-July as a family of three, with a 9 year old. This chacteristic, rural building had been finished to a high specification, and benefited from a stunning aspect over open, rolling French farmland. The silence of the area was remarkable, and yet we were only a short drive from a rich variety of memorable family outings and visits, from medieval castles and postcard villages to woodland labyrinths and prehistoric caves. The gite was well-equipped with a spacious open-plan kitchen, dining, and sitting area downstairs; and lovely bedrooms upstairs with modern en suite bathroom facilities. Outside, the patio was in welcome shade from early afternoon, but plentiful space remained in direct sun and the pool was fabulous. Trish & Neil, who live in a neighbouring gite, provided friendly and attentive support or maintenance, if ever required. Provisions could be bought in a local village or in a good Intermarche supermarket, which was about 20 minutes away by car. If we have a couple of suggestions they would be to consider including a freezer (for ice cream!) and extending the TV channels to include French (for the full Francophile experience). Overall, this was a comfortable and well-appointed base in a stunning location, from which to explore the wonderful Lot et Garonne region. We would readily recommend it. The peaceful and relaxing Tournesol.